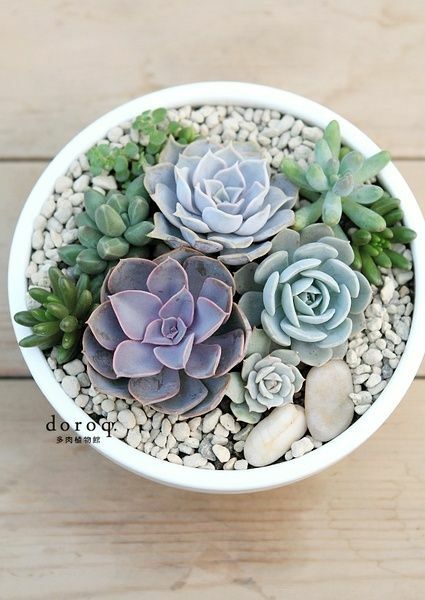 You would have to be living under a rock not to notice that succulents are everywhere in both indoor and outdoor home decor today. I was just on Facebook and noticed a friend even made a succulent wedding cake. Well as a long time gardener I have known the advantages of growing succulents in my garden. They are a virtually indestructible plant if given plenty of sun and dry soil. But I wanted to try and see if I could bring some of these interesting little plants inside my home as well. Because I have a cat I have to be careful on the type of plants I bring inside my home as well as the placement of them. That little stinker gets into everything, and if my plants are not hanging from the ceiling, he will get into them and will chew, dig, and throw dirt everywhere; soo I decided to use faux succulents instead. Now first a disclaimer. 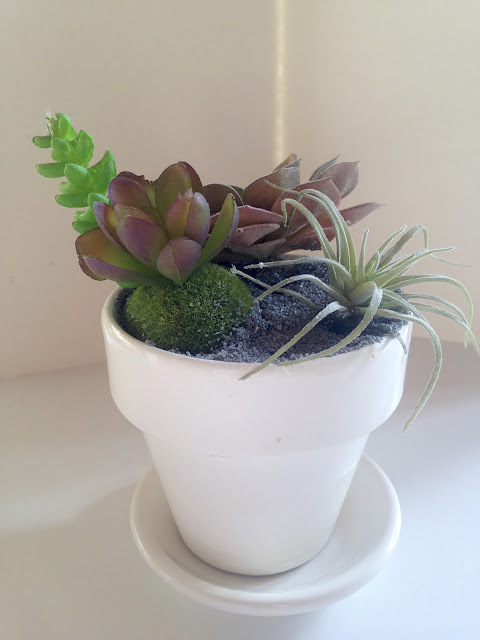 This is probably not the right way to make a succulent pot, but this is what I did because I wanted to use items I already had around the house so I would have to buy as little as possible for my project. I've owned this gigantic bottle of Elmers Glue for about 10 years now, and it is still in perfect condition. I also owned the pot and green styrofoam; so the only thing I had to buy was three little succulents and some gravel. I got everything at Michaels for 50% off. I started by filling my pot with green styrofoam pieces. Then I just filled the little pot with glue. Yep, that's right, I just filled my pot with glue. I did this because of my cat. I knew if everything wasn't glued down, including the gravel, it would end up all over the floor. But honestly, even without a cat, I would have glued it all down. Small children or accidents would also cause the pot to spill and I was worried about the mess of the gravel. I chose this fine grey gravel from Michaels. They also have other types of fillers like small pebbles, bark, etc. It took hardly any gravel at all to complete my project. I only used about an eighth of the container. After I stuck my largest succulent into the styrofoam, I filled my container with gravel. 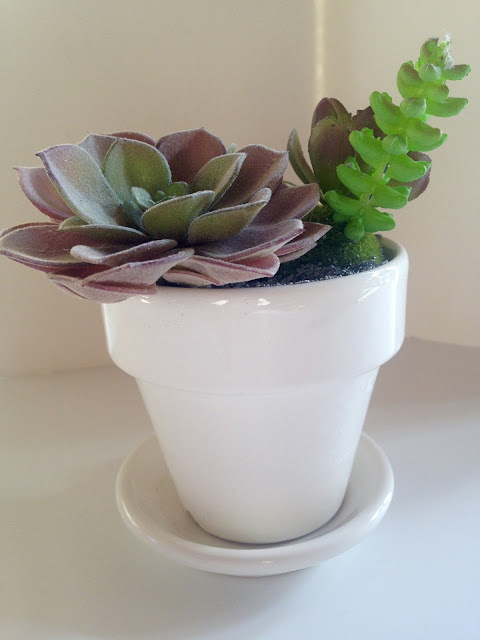 I then added some more glue to the base of my next succulent and stuck that in the styrofoam. My final succulent came attached to a small round piece of moss, so I just dipped the bottom in glue and placed it right on top of the gravel. I did press down a bit and worked it deeper into the gravel. Then I had to set the pot on top of a narrow bowl because the glue was dripping out the bottom of the pot (even though I had a piece of foam over the hole). I left it like this overnight and by the next morning half the container was full of glue. The gravel sunk a bit overnight and left a couple of small holes on the surface, so I just added a few droplets of glue inside those holes and sprinkled in more gravel. This is the completed project. 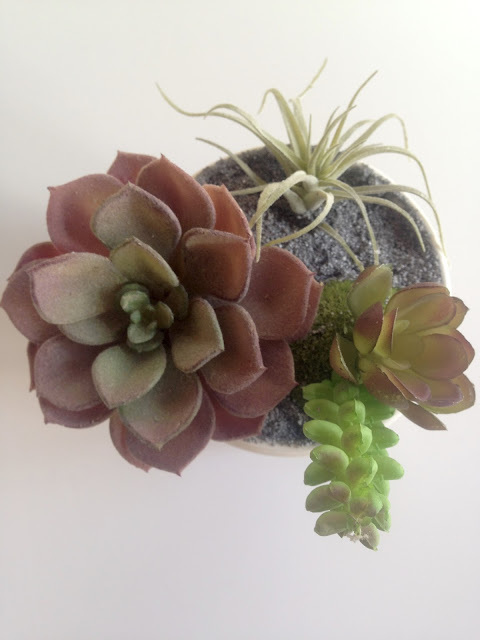 And if my simple project hasn't inspired you to try to create your own succulent planter, here are some other pretty ones I saw on Pinterest! 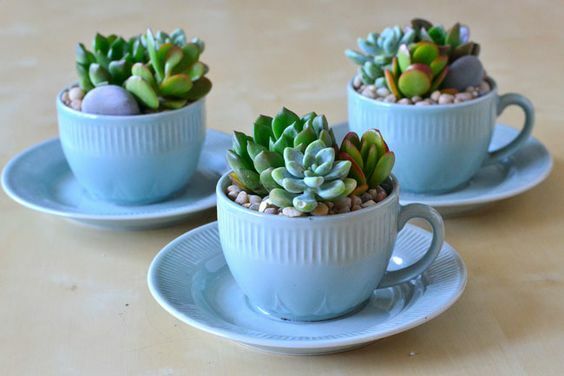 I LOVE these tea cup planters. They used multi-colored little stones as their fillers. 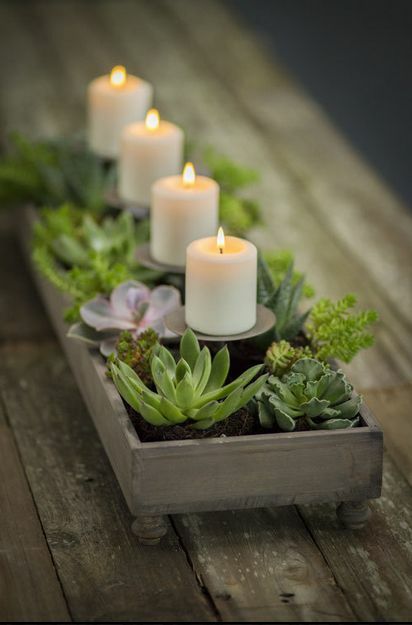 This candle centerpiece succulent planter is gorgeous! Wouldn't this be lovely for a wedding reception? They used a dark fine gravel for their filler. And finally a simple white bowl is used for this larger succulent planter. White stones was the filler used in this pot. So what about you? Do you like the succulent trend or would you rather have a vase of flowers? I'd love to hear from you! So pretty! I love succulents inside and out, too. I have never seen the glue tip before, but I LOVE It! What a great idea. I have 2 cats!! I have a fairy garden in a bird bath outside and I've found that succulents work best as plants in it. I would love to see a succulent wedding cake! Thank you! I've always wanted to do a fairy garden. Maybe I will with the grandchildren one day...or a train garden! My Japanese neighbor (who now sadly moved away) used to have these all around her house, she arranged them in pretty glass bowls. What a great idea to glue the faux ones down! Perfect solution for cat owners! I usually try not to worry too much about my cats knocking things over, I have a large bamboo palm that they occasionally chew on, but luckily they never knocked it over or dug in the dirt. But I made a faux spring flowers arrangement and they have knocked that over a couple of times. Thanks Elli! Yeah I don't usually glue things down either but I could just see the tiny gravel getting all over the floor and scratching it if I didn't. This turned out so cute! I love the centerpiece idea and the teacup idea! Thank you! Yes, I love those ideas as well! Ha! I am giggling over here because when I saw you pouring glue into your pot, my first thought was that you were going to surely kill your plants. Very realistic looking succulents. I am thinking this would be cute in my bathrooms. Too funny! I'm so happy to hear they looked that realistic to you, because finding realistic ones was a challenge!